Greetings from the headquarters of United Electrical, Radio, and Machine Workers in Pittsburgh, Pa where Payday Senior Labor Reporter Mike Elk has just returned after 5 weeks on the road (2 in Oklahoma, 1 each in DC and NYC fundraising, and a fifth final week in Arizona). Earlier this week, Payday reported that AFSCME Local 3299, which represents over 24,000 workers at the University of California system, was calling on U.S. Senator Kamala Harris (D-CA) to skip the University’s commencement over the refusal of the University to settle a union contract. Now in an exclusive interview, U.S. 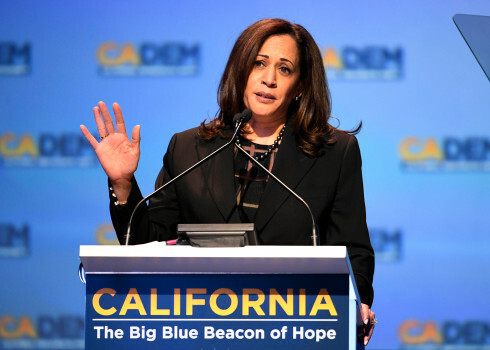 Senator Kamala Harris’ office tells Payday Report that she will indeed skip the commencement address on May 12, unless the UC system and its workers have reached an agreement. On Thursday, the Arizona state legislature passed a budget that labor leaders are saying will end the week-long Arizona Teachers Strike. The budget would guarantee a raise of 10% for all teachers next year, and an additional 10% raise by 2020. Also, the budget would provide for $371 million in extra classroom resources over five years. Teachers had demanded the state fully restore $1 billion in school funding cuts made since the 2008 recession. The bill will raise money through an increased motor vehicle registration fee. A previous proposal balanced the spending with cuts to other programs. Despite a hike in school spending overall, the bill cuts $18 million in funding aimed at desegregating the Tucson Unified School District. All Democrats in the House voted against the bill while only one Democrat in the Senate voted for it. While labor leaders expressed disappointment with the bill, they called for teachers to return to the classroom. “We should take pride in what we have accomplished, and in the movement that we have created together,” said Arizona Education Association President Joe Thomas and National Education Association President Lily Eskelsen García in a joint statement. “The #RedforEd fight continues. And since lawmakers aren’t getting the job done, we will. Today, educators will again rally at the Arizona Capitol. And over the next few days, we will provide additional details about next steps,” read the statement. Now the union intends to use its resources to galvanize voters for the fall midterm elections. Some teachers expressed deep disappointment in the deal. Among other things, the bill does not raise pay for support staff, who made up a key component of those striking. “You guys made a unilateral decision without consulting all of us and you guys insulted all of us,” a tearful Special education teacher named Susan Stoddard told Arizona Education Association President Joe Thomas ina video that went viral on The Arizona Republic’s website. “You insulted us at every step of the way”. Teachers in Oklahoma and West Virginia both held out for deals that included support staff. Folks, thanks to the generous donations of our reader’s Payday was able to both raise over $1,600 to travel to cover the Arizona strike bringing our overall total to $5,831 raised in April. Help us continue our expansion and diversification plan: donate today. As teachers increasingly push to strike, some labor leaders may face pressure from rank-and-file to achieve desired results or lose office. In Oklahoma, teachers frustrated with the outcome of their walkout last month have circulated a petition to impeach the leaders of the Oklahoma Education Association, the top teachers union in the state. The petition criticizes President Alicia Priest and Vice President Katherine Bishop for “calling a statewide walkout without having a lobbying strategy” and putting an “end to the walkout without soliciting feedback from OEA members. Dawn Brockman, a Norman high school teacher who initiated the impeachment petition, told Tulsa World she is close to having the 15 percent of OEA delegates necessary to begin impeachment proceedings. The Oklahoma Education Association would not address the petition directly. However, several rank and file leaders dismissed the criticism of Priest as inaccurate given the difficulties of the fight against the GOP state legislature. “People haven’t quit fighting yet. Those emotions are still there, and are still very raw, but it’s very important how we want to attack that,” Nicoma Park High School teacher Amber Spradlin told the Tulsa World. Tenn. Moves to Bust Campus Workers Union. Last November, Payday covered how campus workers at the University of Tennessee successfully defeated Republican Tennessee Governor Bill Haslam’s plan to outsource thousands of campus jobs. Their effort to defeat the plan was aided by the University of Tennessee Knoxville Chancellor Beverly Davenport, whose vocal opposition to outsourcing lead other universities to similarly refuse to outsource. The firing of Davenport met opposition from campus worker leaders, who immediately denounced the purge. “We have no doubt that her firing is punishment and her removal is because she stood up for us She stood for me” a visibly emotional Edward McDaniel, a locksmith and President of United Campus Workers Local 3865 told a crowd of union activists in Knoxville on Wednesday. Last month, teachers in Louisville-centered Jefferson County School District sparked a statewide strike by going out on an illegal “sickout strike”. Now, the state’s GOP-ed Kentucky Department of Education is moving to take over the school district and remove local control. The move happened only hours after Education Commissioner Steven Pruitt was dismissed by Republican Governor Matt Bevin, who quickly appointed 7 new members to the board to carry out his wishes. “The fact that Dr. Pruitt was fired within hours of a new board being installed I think speaks to the fact that there is an agenda at play, and I personally do not believe that they will be impartial,” Jefferson County Public School Board member Chris Brady told the Louisville Courier-Journal on Tuesday. The School Board will likely sue the state to stop the takeover Jefferson County Teachers Association vows to fight the takeover and is vowing to keep the option of striking on the table to resist the takeover. In February, Payday covered the fight of workers at Disney World to win $15 an hour. Currently, the minimum wage for workers at Disney World is $10 an hour. Now, Disney World has agreed to pay its 38,000 union workers $15 an hour by 2021. Unions representing the workers said they have not yet agreed to the proposal since Disney World wants to renegotiate overtime pay and other features of the contract. Earlier this year, the company withheld $1,000 tax cut bonuses from the workers because they refused to ratify a contract proposal. The six-union Service Trade Union Coalition filed an unfair labor practice charge with the NLRB regarding the withholding of this bonus. Workplace Deaths Skyrocketed in 2016 During Last Year of Obama Admin. This week Payday remembers the astonishing 5,190, who was killed on the job in accidents last year according to a report released by the AFL-CIO. The report last week entitled “Death on the Job: The Toll of Neglect” marks the 27th year that the AFL-CIO has released an annual report with its filing. The report found that even in the last year of the Obama Administration, workplace death skyrocketed from 4,836 deaths in 2015 to 5,190 death in 2016. The crisis is only expected to get worse as Trump Administration attempts to clampdown on OSHA’s ability to enforce the law. “It’s a travesty that working people continue to lose their lives to corporate greed. The selfish and reckless decisions being made in boardrooms and in Washington are killing the very people who built this country” said AFL-CIO President Richard Trumka in a written statement. “This is officially a national crisis, and it’s only getting worse,” said Trumka. With that, we pay our respect to the dead and promise to keep on fighting for the living. We’ll be back next week folks, Have a good weekend Y’all. Be the first to comment on "EXCLUSIVE: Kamala Harris to Skip UC Commencement at Union’s Request – Tenn Gov Moves to Bust Union – Arizona Strike Settlement"